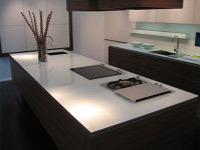 Glass is still a material that clients don’t often think of when they are considering their kitchen worktop options. It is probably the most visually stunning of all kitchen worktops. It can look amazing when designed in conjunction with ambient lighting and plain contemporary door styles and colours. On the down side, it can be a nightmare to keep it looking good! It tends to show every scratch, smudge and smear. This means you will have to constantly clean and polish it to get the most from its vivid, reflective surface. Glass is fabricated by specialists who now produce a wide range of colour options including some unusual metallic effects. The edge details available are limited, as is the thickness, which is normally 20 or 30mm. 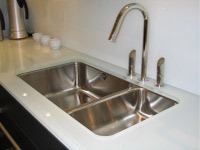 However, you can still select upstands and splashbacks which help to keep the overall colour scheme minimalist. If you don’t mind the cleaning aspect and long for a completely dynamic and individual look for your project, then glass will definitely offer something different. 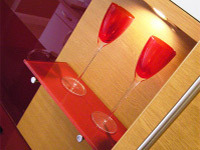 Glass also works incredibly well with other worktops in certain design scenarios. Please feel free to ask your designer to explore how best to blend different textured and coloured worktops in relation to your own project.